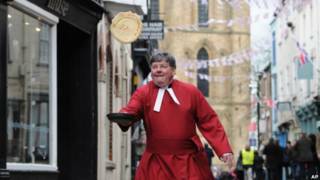 Image caption The Very Reverend Keith Jukes tosses a pancake during a race. Photo by Anna Gowthorpe. Shrove Tuesday is the day before Lent begins in the Christian church. In England, it is also known as 「Pancake Day」 because traditionally pancakes are eaten on this day. This is because pancakes are made from ingredients that need to be used up (sugar, butter, eggs and flour) before the 40-day fast begins. It's a toss-up between pancakes and risotto tonight. I'm not sure what to cook yet. We haven't recruited a presenter yet, but it's a toss-up between Sarah and Julie. My boyfriend doesn't know what he wants for his birthday yet. It's a toss-up between a new mobile phone and an e-reader. My friend wanted to go to the cinema but I really wanted to go ice-skating instead. We tossed a coin to decide: I chose 'heads' and won! Neither of them wanted to do the washing up, so they tossed a coin. They decided if it landed on 'heads' she would have to do it, and if it landed on 'tails' he would.